With social media so ingrained in our everyday lives, we can all get caught up in the excitement of going on holiday or buying a new car, and share a seemingly-innocent snap on our Facebook or Instagram page. But are we putting ourselves at risk by disclosing too much? We've partnered up with security experts Yale, and have carried out a comprehensive study into what people throughout the UK are sharing on social media. Our interactive map shows the connection between our study and UK crime statistics*, revealing which areas are clearly vulnerable to crime. We're here to help give you the confidence you need to stay safe on social media, and remove any nagging doubts you may have about becoming a victim of crime. Read our helpful guide to staying safe on social media, our social media crime facts, plus Yale's top five security tips. Ensure your possessions are covered in case of burglary by checking your home insurance policy or speak with Swinton to see how we could help today. 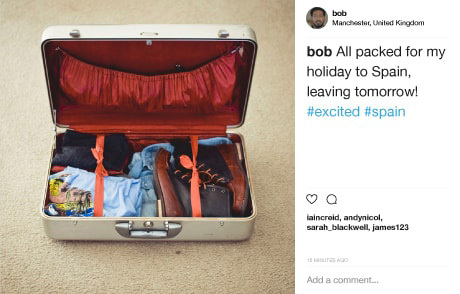 Bob is active on social media. He, like many others, likes to shout about his activities on his Twitter and Instagram accounts. Does this put him at risk? Let's find out. How vulnerable are you on social media?